Hey guys! I'm here today sharing my 5 favorite fitness related apps. We always have our phones with us, so why not use it as a tool for a healthier life? It's amazing how powerful some of the apps out there are! This app is so simple but so awesome. Basically, you open it up when you start an outdoor walk. Then it tracks the route, pace and distance of your walk! It's cool to be able to save your routes so you can look back on them in the future. If you find yourself with a spare 20 minutes, you could look through your previous routes and see which one fits into your time frame! I have been using this app for years and I absolutely love it. It literally pays you to be active! 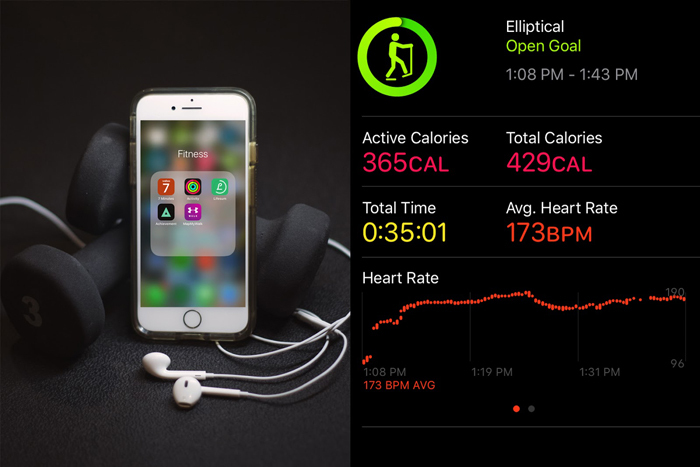 The app tracks steps you take as well as "healthy activities" you do. This includes when your apple watch tracks your sleep and heart rate if you have it connected to the app. Once you hit 10,000 points, you can cash it out for $10 through Paypal! The app also occasionally offers surveys and studies for points. I did a super easy and informative study recently and was paid $50 for it! It literally took only minutes of my time. This app is super motivating to me - it really makes me want to get up off the couch and be active to get more points! The best part about this app is that you don't have to have it open to track your steps, even when the app is closed it tracks them! This is a really awesome app that lets you input your daily food, exercise, and water intake. It's a great tool to help you track calories and other nutritional numbers. One of my favorite parts of the app is that you can scan the barcode on your actual box of food so you don't have to guess what the correct nutrition information is. This Apple Watch app has changed my life! I love looking at statistics from my workouts. It helps keep me inspired and makes me work even harder. To use the app, just pick the activity you are doing on your watch and press start. Then when your workout is done, just press end! That's it! It monitors active calories, total calories burned, time, distance, average pace and heart rate. I had been looking for a free app that is like a trainer and walks you through workouts and I finally found this one! I don't make it to the gym every day, so I like to use this app as part of my at-home workout. The concept behind this app is that everyone can find 7 minutes in their busy days to get active. It walks you through a simple 7 minute workout every time you open it! Have you used any of the apps above? What are your favorite health and fitness related apps?